Hiking in some hills near Taipei after a rain, I saw lots of large snails out and about. Here "large" means the shells are say 8 cm long, and the snail itself fully stretched out 10 to 15 cm perhaps. At one point I saw a cluster of four snails stuck together in a confusing way. The one on the right was slowly climbing uphill, pulling the other three along. What is going on here? I see some connections between some of the snails, but I can't really understand most of what I'm looking at here, nor why four snails would be stuck together sideways like this. 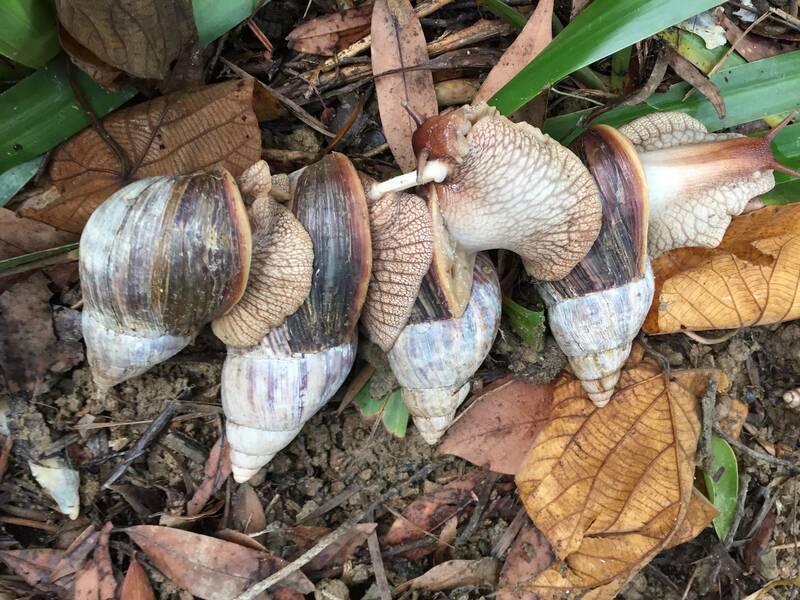 These are probably giant African snails, Achatina fulica, an invasive species of land snails. The two snails in the middle are mating using love darts. The other two may be waiting for their turn. 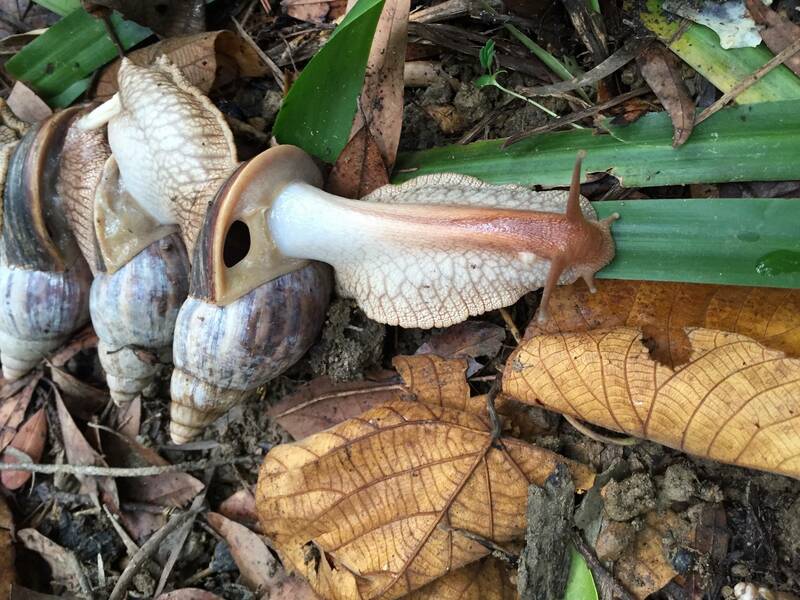 These snails, Achatina fulica, belong to a family of land snails called Achatinidae. They are invasive and while being agricultural pests, can also be vectors of pathogens. The two snails in the middle are actually mating through a reciprocal simultaneous exchange of gametes through the sexual organs that are clearly visible. These species of land snails do not use love darts as suggested by Dr. Evenor. Not the answer you're looking for? Browse other questions tagged behaviour gastropod or ask your own question. What are the universal laws of Nature concerning animals' behaviour? What are the most common mechanisms motivating mammals to mate? What are the factors that contribute to genetically identical individuals behaving differently? 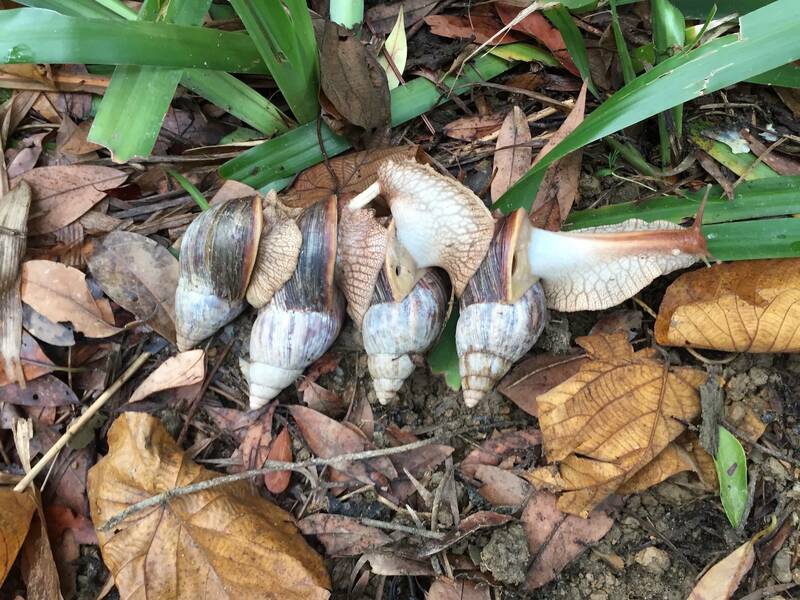 What species are these snail shells?